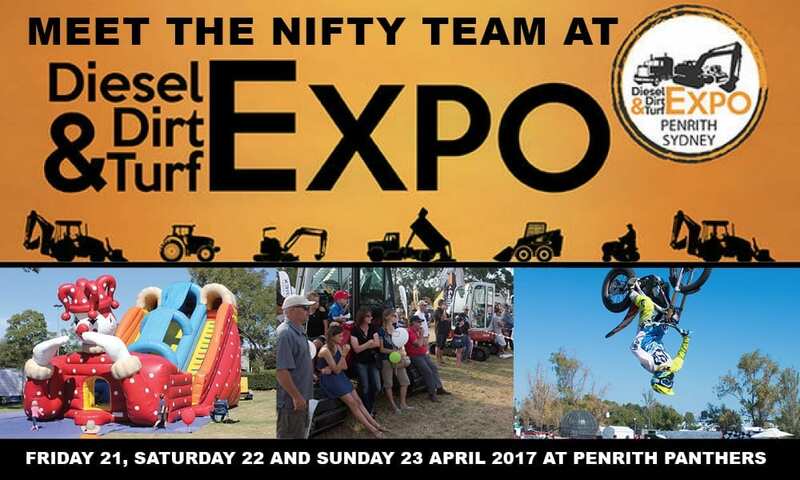 The team at Nifty are excited to be exhibiting at the Diesel Dirt & Turf Expo in April 2017. Please come and visit our tent and see our machine demonstrations. The expo is a fun and free family-friendly event at the lake behind the Panther’s Leagues Club. Designed to boost the Western Sydney construction boom, the aim is to help construction contractors keep up to date with the latest technology in earthmoving, construction and public space maintenance equipment. Last year’s show attracted crowds of 30,000 people and in 2017 the best of the West returns on April 21st through to April 23rd. Diesel, Dirt and Turf Expo 2017 will be even bigger – the most exciting show in decades. There will be 3 jam-packed days with two large licensed hospitality areas and live music. It’s a family-friendly show with loads of entertainment for everyone. Keep the kids occupied while mum and dad look for that deal that they have been waiting for. You can expect motorcycle stunt shows, vintage trucks & machinery, live demos, operator challenges, entertainment for the kids, and much, much more. If there is just one trade show you attend in 2017, make it this one. It is not to be missed. Mark the Diesel, Dirt & Turf Expo down on your calendar as a must attend! Sunday 23 April: 9.30am – 3.00pm.